Robert Jr. Lockwood often told writers, including this one, that he was sure that if Robert Johnson had not died so soon in life, he would have grown out of the blues and morphed into a jazz player. Robert Lockwood certainly did that, keeping one foot in the blues, the other in jazz. So did Snooks Eaglin, whose blues was based on a jazz chord structure, yet unmistakably blues. Meet Adam Falcon, a brilliant soul from the Bronx, New York, who now makes his home in Suffern, New York, not far from New Jersey. 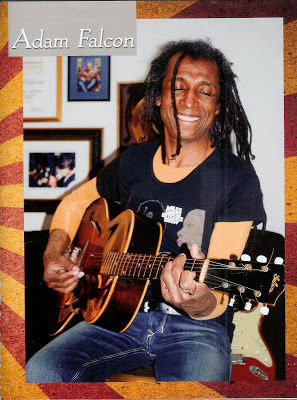 He’s a swift acoustic player whose blues are distinctly reminiscent of players like Snooks Eaglin and Taj Mahal, players who expanded the blues horizon while keeping true to the spirit and feeling of the old blues. As bluesman Phil Wiggins said, “The blues keeps evolving. It’s not locked into a museum vault and frozen in time.” The individualist Adam Falcon is not locked down by other people’s conventions. He plays what he feels. His mother was from Harlem and his father was from New Orleans. Adam Falcon heard Louis Jordan, Fats Domino, Snooks Eaglin, and Louis Armstrong records around the house as a kid, as well as a broad selection of African American music. As a teenager of the baby-boomer generation he had his ears open to it all: the Beatles, R&B, Motown, B.B. King, Dylan and all that music that formed sounds of the generation of the late ‘60s and ‘70s . He graduated from high school and studied music at Bronx Community College and right afterwards went on tour with the singing group Revelation, and in 1975 they opened for the Bee Gees. For years he worked as session guitarist and road-dog backing the likes of Stephanie Mills, Phyllis Hyman, and Whitney Houston. He opened for Eric Clapton at London’s Royal Albert Hall. His own fiery compositions pack a punch and he wrote some fierce blues songs that will grab anyone’s heart and soul. The song “True Blue” that he wrote for the multi-Grammy winner George Benson was noticed by The Song Writers Hall of Fame, which bestowed him the Abe Olman Scholarship Award for Songwriting in 2007. Another composition “Like A Soldier” was used in the national television series, The Injustice Files. 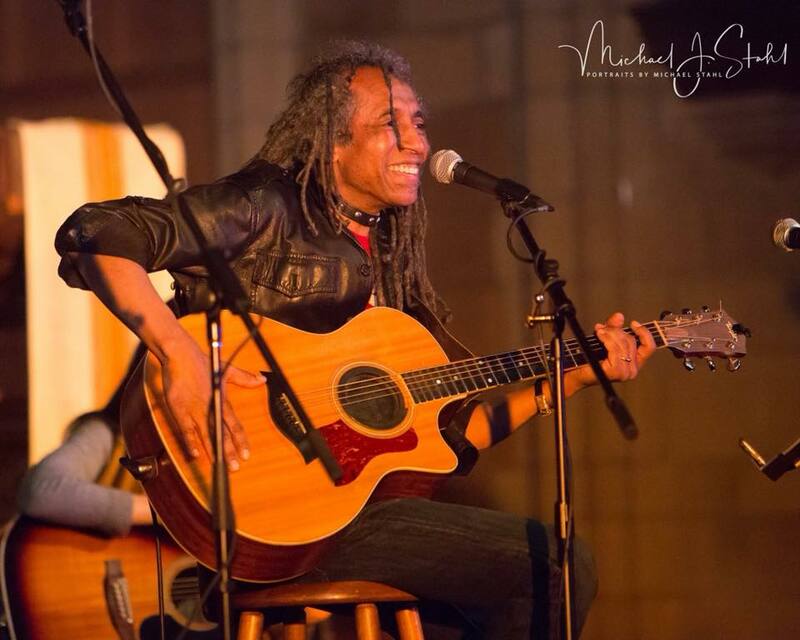 His powerful blues song “Woke Up Cryin’ ” (see the video below) made Falcon a semi-finalist in the International Songwriters Competition, as well landing him a nomination in the blues category of the Independent Music Awards. You can find Adam Falcon’s CDs on CD Baby and his downloads on i-Tunes and Spotify. He plays mostly around the New York region, with occasional trips to New Orleans. He’s a regular at top local venues: The Falcon, Daryl’s House in Pawling, The Turning Point and The Towne Crier Café in New York. He frequently opens at big venues and he has opened shows for James Cotton Blues Band, Matt “Guitar” Murphy, The Wailers, Jim Lauderdale, Tower of Power, Ruthie Foster and many more. 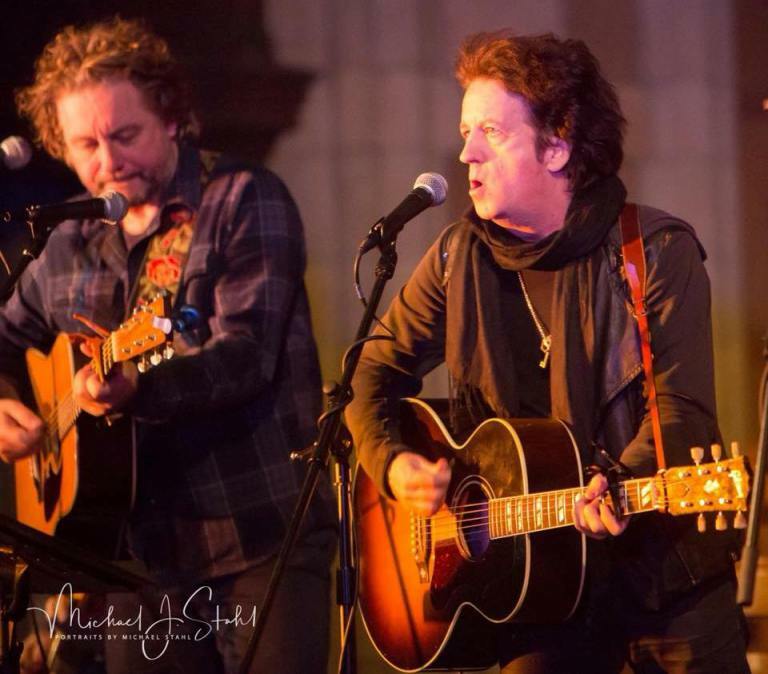 PHOTOS BY MICHAEL J. STAHL From left, James Maddock, Emily Grove, Willie Nile, Jeffrey Gaines and Joe D’Urso at the Light of Day concert at the Outpost in the Burbs Montclair, Jan. 5. Communities converged at the Light of Day concert at the Outpost in the Burbs in Montclair, Jan. 5. The long-running Outpost has a community of its own, as does the Light of Day festival. The musicians on the bill formed a sort of community, too: Many had worked together before. And tying this Songwriters in the Round-style show together even more was the fact that it was, in part, a tribute to one of the most universally beloved rock singer-songwriters, the late Tom Petty: All eight performers were asked to include one Petty song apiece in the show. “Somewhere in there, there’s a song for everybody,” said Adam Falcon, referring to Petty’s vast songbook, before performing “I Won’t Back Down.” “This one speaks to me,” he added. Falcon [also] provided an early highlight with his haunting blues song, “Woke Up Crying,” which he wrote for his late mother, who had Parkinson’s disease. James Maddock, left, and Willie Nile at Outpost in the Burbs. Emily Grove at Outpost in the Burbs. Adam Falcon at the Outpost in the Burbs. While Light of Day — which has raised more than $4.5 million for Parkinson’s disease research and related causes over the last 18 years — takes place mainly in Asbury Park (and will do so again this year, though Jan. 15), it has begun, for the last four years, with an Outpost show. This year’s lineup offered a good mix of familiar and new faces, as Nile, Maddock, Gaines and D’Urso had all done the Outpost LOD show at least once, while Grove, Falcon, Caspi and Rose hadn’t. Other standout numbers included Maddock’s cover of Petty’s “Fooled Again (I Don’t Like Again)” — one of those gems that hasn’t been covered much since Petty died, only because he has so many other great songs — and D’Urso’s “Hold On,” which ended the evening on a hopeful, heartfelt note (before that final, celebratory “Light of Day” encore). Later, Grove was mesmerizing on her solo, a cappella “Johnny Lee,” and Maddock sang his “Leave Me Down” with so much plain-spoken soul that Gaines said he thought Rod Stewart should record it. (Good idea.) Gaine provided two of the show’s best moments with “The Waiting” and his own “Right My Wrongs,” while Nile — still incredibly prolific, deep into his career — was most impressive on “Looking for Someone,” an uncharacteristically playful, new and, as yet, unreleased song, co-written with the late Andrew Dorff. October 17, 2016 guitarist, singer/songwriter Adam Falcon of Suffern, NY was named by Music Resource Group (MRG) as a Nominee in The 15th annual Independent Music Awards (The IMAs), the influential awards program for independent artists and releases. More than 400 innovative self-released and indie label projects culled from thousands of submissions worldwide, were nominated by fans and industry in more than 80 Album, Song, EP, Music Producer, Music Video and Design categories. The winning projects will be selected by blue-ribbon panels of top recording artists that include: Tom Waits and Kathleen Brennan, Slayer, The Kills, Lalah Hathaway, Meshell Ndegeocello, Sepultura, Dido, Warren Haynes [Gov't Mule], Suzanne Vega, Gus Unger-Hamilton [alt-J], Shelby Lynne; previous IMA Winners including:Amy Lee [Evanescence], The Show Ponies, Noshir Mody, Rozina Pátkai and Ingrid Gerdes, among many others; and influential press and talent buyers from the Americas, Europe and Pacific Rim. The 15th Independent Music Award Winners will be announced November 12th from Lincoln Center for the Performing Arts in New York City during a free, day long music festival showcasing exceptional IMA talent. Kicking off the event will be a ‘town-hall’ meeting where fans, bands and industry discuss new ways to keep independent arts alive and prospering. Previous IMA Winners & Nominees include former major label acts including Jackson Browne, Pete Seeger and Martin Sexton; and cutting-edge rising stars including Flying Lotus, Amanda Palmer, Killer Mike, Lacuna Coil, Amy Lee, Passenger, Team Me, Radio Radio, RuPaul, And You Shall Know Us By The Trail of Dead..., Meghan Trainor, Lionel Loueke, Girl In A Coma, Apples in Stereo, Pokey LaFarge, Valerie June and many, many more. 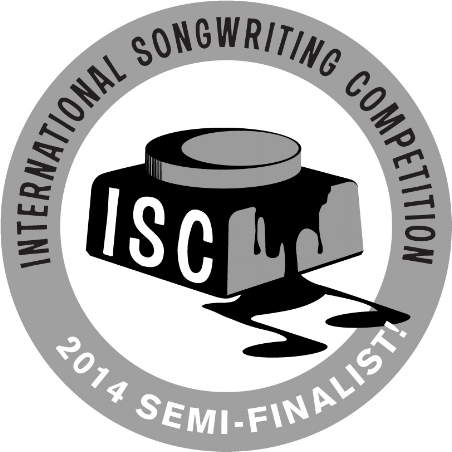 In the International Songwriting Competition (ISC) out of more than 18,000 entries, semi-finalist make up the top 10 percent of all entries. Not too shabby, I'll take it! Thanks (ISC). A series of interviews by Mr. Media, Bob Andelman. I watch guitarist Adam Falcon as he plays a song for me. “October Falls” captures the beauty of the moment when he first fell in love with his wife Kate. His slight frame leans over his guitar as a few rows of his of his long braids topple over his face. Raw emotion oozes from the man and guitar. His power over the music has left me spellbound. Adam had a good fortune as a teenager growing up in the early seventies. He took guitar lessons at the YMCA in Manhattan with Larry Lucie who used to play with Duke Ellington and Count Basie. He went on to study for three years with the infamous George Benson before George’s career took off. By the time George signed a record deal with Warner Brothers, Adam was ready for his own journey. At twenty-one-years-old, Adam got a job with a group of four singers called Revelation and they toured with the Bee Gees. His greatest moment came six years later when the instrumental song he wrote “In Search of a Dream” was accepted by producer Arif Mardin for inclusion on George Benson’s Grammy-nominated album In Your Eyes. Adam became well-recognized in the music circuit. He worked with artists like Phyllis Hyman, Sophie B. Hawkins, Robert Palmer, Will Downing and Jonathan Butler. He also toured with Roberta Flack, someone he’d admired ever since his mother took him to see her in Central Park. Adam’s musical style has two major influences - the music aired on WNEW-FM radian from 1968 to 1970 combined with the added the pulse of today’s music. With no definable genre, he has created a sound all his own- an eclectic mix of soul, rock & roll, country, jazz, and the blues. A ukulele leans against the fireplace in Adam’s living room. He bought it for his three-year-old son after the child crooned over it in a music store. Adam speaks of a time when he was his son’s age. My dad, who is from New Orleans, bought me a plastic guitar because I watched Chuck Berry perform on TV. Gene Autry was another one of Adam’s idols at that time. “I was obsessed with being a cowboy. When I saw Gene Autry on TV with his guitar and cowboy boots, I thought, ‘There it is. Two for one. I can be a cowboy and play guitar!’” As far as I can see, Adam has fulfilled his dream. The sheer love of music exhibited by the beaming kid holding the toy guitar on the cover and the man leaping enthusiastically on the inside sleeve continues well into the grooves of Adam Falcon’s Bohemian 959. Smooth melodies frame the voice of a classic crooner with influences from Seal to Smokey Robinson, but when he gets his groove on more aggressively with “Soul Satisfied” and “Like a Soldier,” or shows a fondness for the blues on “Better Days,” he makes an equally formidable impact. Bohemian 959 benefits from not only Falcon’s versatility, but his polish and professionalism as well. Poised and confident, Falcon is ready to soar..
Singer, songwriter, guitarist Adam Falcon continues to assert his influence as an independent recording artists with this release of his third solo album, Bohemian 959 (Ghetto Drum Records). According to Falcon, many of his musician friends gave up their time to contribute to this album including a number of fellow SESAC writers like K.J. Denhert (contributing vocals on “Going Back for More”), Martha Redbone (performing background vocals on several songs), and singer Marc Nelson from the 90s boy-band Az Yet (contributing vocals on the song “Like A Soldier”). Nona Hendryx wrote the albums first single “Sunshine Woke Me Up This Morning,” back in the day as a member of LaBelle. Falcon re-recorded it for Bohemian 959 with Ms. Hendryx as his duet partner. The album’s only other cover tune is an inspiring remake of the Jackson 5’s “I Wanna Be Where You Are” ; with the remaining songs all penned by Falcon himself, and Trevor Gale as producer. That’s no typo! SESAC Vice President of Writer - Publisher Relations Trevor Gale, an amazing musician in his own rite, plays drums on two cuts and produced the entire album. Of course there is an explanation behind the unique title, Bohemian 959. The numbers 959 represent the address where Falcon grew up in the Bronx. His residence was like a meeting ground where musicians in the neighborhood would often come and play. In the spirit of his childhood home, a New York City loft was converted into a studio for the recording of Bohemian 959. Some of the best musicians were brought together within one room and tab the same time to record the album live. Falcon, now a father of two toddlers, a girl (3) and a boy (1 1/2), has generated quite a following with his previous works: Piece of Mine, and I, too, am Colored, in Black & White. He is appreciated by numerous icons in the business, like multi-Grammy winner George Benson who recorded two of his compositions, “In Search of a Dream” (produced by Arif Mardin), and “True Blue” (produced by Tommy LiPuma). Falcon has toured as a guitarist with the likes of Phyllis Hyman, Jonathan Butler, Will Downing, Sophie B. Hawkins and Roberta Flack. “Adam Falcon is one of those artist whose music speaks to the very core of human emotions,” says Trevor Gale. “His passion takes you from where you were to where you wanna be. It is true soul music!" Adam Falcon steps up to the mic with an easy smile, an acoustic guitar, and Marley-esque dreadlocks that swing below his waist. But don't be fooled—when he opens his mouth, instead of the punctuated, Caribbean accent you might expect, the slim, petit singer speaks in a smoky tenor suitable for a late-night, smooth-jazz DJ. And when he croons, he meshes elements of jazz, funk, and soul with a hint of pop. He's performed in various Rockland music hubs—Piermont's Turning Point Café and the Something Unexpected Art Gallery in Nyack—and he teaches guitar at Rockland Conservatory of Music in Spring Valley. But most of his gigs go down in swanky Manhattan lounges. Having completed a tour in February, he's taking the next few months to record. Circling the music industry cul de sac since the tender age of 15, Falcon pulls influences from music of the late 1960s and early '70s—he fondly recalls a Led Zeppelin concert he attended with his father when "the tickets were a dollar-fifty!" He says, "My music is more reminiscent of a period, not a genre." Probably because, as a backup guitarist, Falcon has traded chords with some of the biggest names of that period, starting at age 18 with jazz icon Jonathan Butler. In the '80s, he nabbed an opening spot on an Eric Clapton European tour, and backed Whitney Houston across America. He toured with Peter Gabriel, the Bee Gees, Sophie B. Hawkins, and Roberta Flack in the '90s, and wrote two hit songs for George Benson. The clincher? One February night last year, Jimmy Buffet jumped onstage to join him during a regular gig at a club on the island of St. Bart's. "It's been wild," Falcon smiles. "But now I'm focusing on me." Though he would be hard-pressed to turn down a major label, he's enjoyed the freedom of working on the two-artist label Ghetto Drum Records, produced by his friend Trevor Gale. "The independent artist lifestyle is very bohemian," he says. "You record where you can—in a hotel room, your kitchen, a studio, a tour bus—I even have an amplifier in my Volvo." —A.G.